SYNOPSIS: Diagnosed with Stage IV thyroid cancer at 13, Hazel was prepared to die until, at 14, a medical miracle shrunk the tumours in her lungs... for now. REVIEW: I often saw this book being read around campus at the time I decided to give it a try. I figured, I should see for myself if it's worthy of the hype. And now I can say, indeed it is. 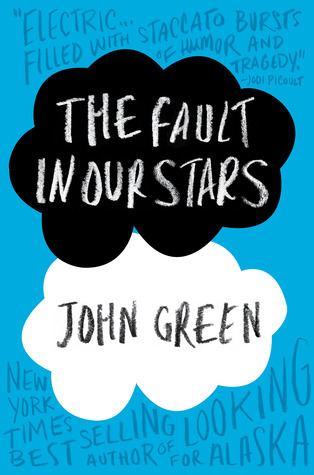 The Fault in Our Stars is the first John Green book I've read so I had no idea how he writes. The story was different for me than the other books I've read with the same underlying theme - inevitable death. First, I liked Hazel's pragmatic view of life. She didn't want cancer to be her life but rather just a side effect of living. She tried to live normally as possible even if she needed to carry a small oxygen tank around in a cart because her lungs weren't strong enough to breathe on their own. I liked that aspect of the book because it's not, as the characters would call those types of books, a "cancer book." Secondly, I liked Augustus Waters a lot. He's one very likable character overall. He's light and witty - his personality fits very well with Hazel's. I enjoyed reading the book because their friendship just seemed so natural and it progressed beautifully for me. It's not so much as them trying to find consolation with each other because they're both cancer kids; it's them enjoying each other's company because they have the same perception of how they should live their life. The only factor that caused me to rate this book a 4 out of 5 was the rather unrealistic way in which Hazel and, most importantly, Augustus articulated their thoughs. No teenager talks that way! It's not like I didn't enjoy it - I did on some level. Because I have a soft spot for guys who can speak the way Gus did (dorks are the bomb). But at the back of my mind I always felt like all their dialogues, if set in a different scenario, would otherwise sound too unrealistic. I know it's a work of fiction but I also want a way for me to be able to connect to the characters all throughout. I mean I loved the characters but at some point in the story, their dialogues were too much. Having said that, I'd still encourage you to read this book. John Green was able to draw my emotions in. Even if I didn't always enjoy the way the characters spoke, I still felt like their story's real. The way they casually talked about death and afterlife with such acceptance and normality was heartwarming and heartbreaking at the same time. I laughed with them. I cried with them. Overall, it's an experience that you just have to go for. In 2007, John and his brother Hank were the hosts of a popular internet blog, "Brotherhood 2.0," where they discussed their lives, books and current events every day for a year except for weekends and holidays. They still keep a video blog, now called "The Vlog Brothers," which can be found on the Nerdfighters website. Nice review, Sab! It sounds like it would be a great read! I'm glad someone shares the same sentiment. Thanks for reading my review, Sandy! Great review, and I love how you included something that maybe wasn't so fantastic about the book, too. I think that's how we learn the most about books before we read them. I loved their dialogues too but at times I wished John Green toned it down a bit. LOL but it's still a great read ;) Thanks for reading my review, Kelly! I really appreciate it! I read An Abundance of Katherines, the lead is a super smart boy and he talks the same way. I think it works for his character.... come to think of it, I think "nerds" is John Green's thing. And because of that, I love him all the more. Ha! Have you ever heard of his vlog on YouTube? Vlogbrothers, he does it with his brother Hank (who may be even more awesome, if it's possible). If you love nerds, you'll LOVE vlogbrothers. I've read Paper Towns and Looking For Alaska by him, they're both extremely similar. Good on their own, but honestly, I wish they weren't SO similar. That's my only problem with John Green, most of his books share the same nerd-boy/rebel girl characters. But I still adore him and won't stop until I've read every book he's published. I've heard the same from other Goodreads users. I haven't read those two but I will soon! And I feel the same way, I think I just have to read every John Green book there is! I will definitely check out their vlog! Nerds have a special place in my ♥ haha! I own a copy of this book, and cannot wait to read it. I just know it's going to be a special read. I love that you called it amazing, Lauren! Thanks for the review.